Please join me in wishing Happy Birthday to B, aka TheAngelForever, aka my wonderful wife and mother of our children. Yes, today is her birthday. The celebrations will include an oven delivery and a possible event to attend for NHL (if the weather doesn’t get so bad that it is cancelled). Seriously, she has bad luck with birthday scheduling. It seems like something always hits right on her birthday. One year, I’d love it if she could sleep late (not rush to get the kids ready for and then off to school), spend the day doing anything she wanted to do, and be able to go out to eat where ever she decided to go to. We’ll celebrate her birthday another day, but it won’t be the same. I’m so happy that B is in my life. She’s a wonderful wife to me and a fantastic mother our kids. She takes care of so much both around the house and in our lives. She fights to ensure that our kids have a good education, makes sure all of our bills are paid on time (I *may* have missed a few due dates when I was in charge of them), steps in when NHL and I are butting heads, and not only puts up with the high level of geekery in our house, but even participates in it. I couldn’t imagine life without her. 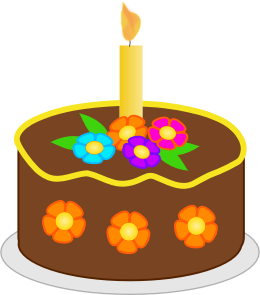 NOTE: The "Chocolate Birthday Cake" image above is by version2 and is available from OpenClipArt.org.